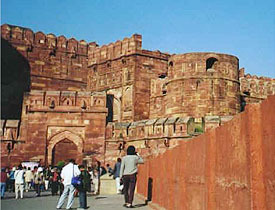 Akbar, the grandson of Babar built his capital at Agra and laid the foundation of the Agra Fort. He began construction of this majestic fort in 1565 when he was only 23 years old. This imposing red sandstone structure is the finest example of craftsmanship of the Mughal era. After Taj this was one of the most important group of buildings. The construction was started in 1565 and was completed in about eight years at a cost of thirty five lakh of rupees under the superintendence of Qasim Khan Mir Barr-u-Bahr. This fort was built on the banks of the river Yamuna. This fort was just one of the many large fortified residences that the emperor wanted to have at various strategic points of his empire. This fort contained over five hundred buildings. Agra fort is built in a triangular form and covers an overall area of about 1.5 miles. Of the four gates, the Amar Singh Gate to the south is the only one gate which is open to the visitors. The Jahangir Mahal with its fretwork is the largest private residency within the fort. To the south of Jahangir Mahal are the ruins of the Akbari Mahal, guilded by a pillared hall. The Nagina Mosque lies to the left of the throne room. Beneath this existed the Meena Bazar, from where the ladies of the house watch the merchants who display their silks, brocades and jewellery in the courtyard below. At the Chittor Gates, trophies of Akbar's captures of a Rajput fortress in 1657 are displayed. 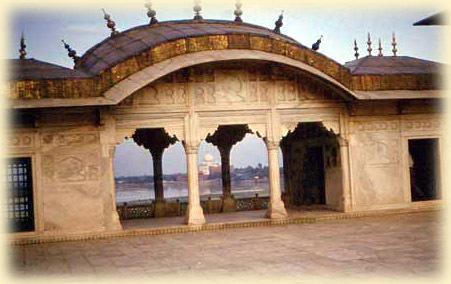 Towards the riverside is the Diwan-e-Khas, built by Shah Jahan in 1637. Some various other buildings in the fort are the Khas Mahal, the Golden pavilions, Anguri Bagh, Sheesh Mahal, the legendary Gates of Somnath and Jami Masjid.